Ah, Ibrahim needs a hug. Haha, thank you so much! That’s a very accurate picture of him. He definitely needs a hug! Everyone in this comic needs a hug. Haha! He’s pretty good at them. Also, the timing on this page is great! Five times a day? Must be tough on the knees. I thought it was eight times a day. According to my reading, it’s just five, but maybe there are sects that do it eight times a day? I can’t say for certainty, but most is just five times a day. Muslims pray by prostrating themselves in the direction of their holy city. Five times a day they have to stop what they’re doing, grab a compass and a map, then get on all fours and get their face as close to the floor as possible without cutting off air. This is why the fez was such a hit with them. I am absolutely LOVING the attention to detail you put into this. The authentic call to prayer, the beautiful architecture, it’s amazing. It’s times like these I realize just how beautiful these people made everything. Their writing, architecture… It’s all fantastic, and you did a great job showing it. All in all, you did a great job with this page. Thank you! Yeah the stuff they created is even more amazing than what I can draw here. It’s just stunning stuff! 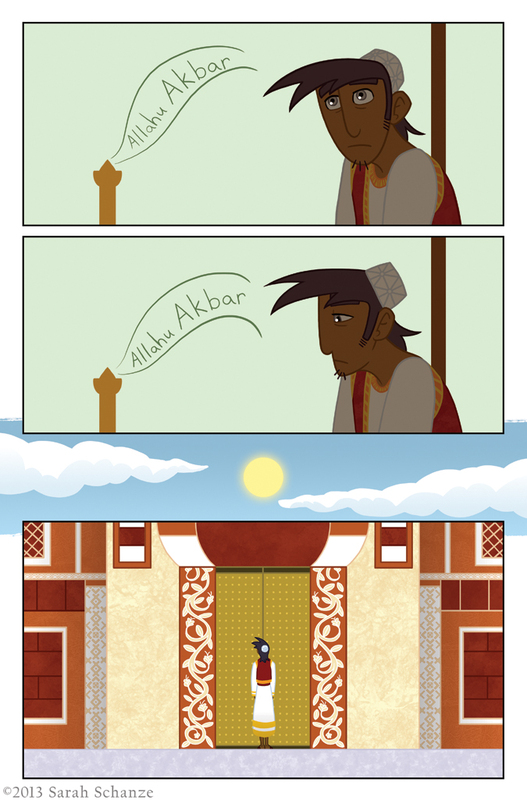 He looks so sad D: Poor Ibrahim… Makes me wonder what sort of person his father is. Haha, don’t worry, you’ll meet his dad soon! I am excited to see how you designed his father. So far I’m lovin’ all these new characters, even if they won’t appear again. I kind of know how Ibrahim feels when my parents and teachers talk to me about my future like for collage and jobs it can be so stressful especially when I don’t see eye to eye with them on certain things. Yeah, talking about the future can always be tough! Ibrahim will just have to deal with it. You know I’ve been starting to wonder what time this is set in ever since titling Plato as an old philosopher and I think I can just about hazard a guess at 107 A.D.? Somewhere along the lines of that. TMK actually takes place during the Viking Age, which was late 700s to early 1100s (AD), give or take. Ibrahim lives in Cordoba, in present day Spain, when the Moors were in charge of most of that country at that time. Thank you for reading!